This page provides a short review of each day’s activities during the meeting. Announced a year ago at the meeting in Poznan, the Rotterdam meeting begins in three days. After a few brief visits, the preparation team made up of brothers of Taizé, Sisters of St. Andrew and young volunteers arrived in Rotterdam in September. Their task was primarily to invite the churches and families to welcome the young participants and to organize the program. Today, many brothers and young people have already arrived in the city for the final preparations: the meeting will begin on December 28. This Sunday, December 26, the meeting began to become real when some 1100 young people who will help arrived. Their main task will be to welcome young people who will arrive in Rotterdam in two days. 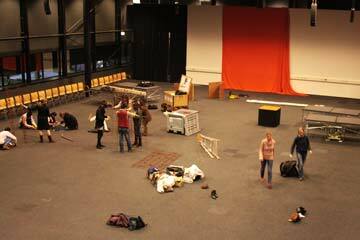 Some will help with final preparations in the halls of Ahoy, where the common prayers and meals will take place. The choir practice that will support the singing prayer have also begun. After a long journey for those coming from afar, everyone went to one of the host churches. The host families have received their first guests. In the afternoon, everyone then began the first tasks that will allow the meeting to take place in a spirit of sharing and simplicity. This preparation is also continuing in prayer which brings together, three times a day, all these early participants. Ulli (Germany) took part in the European meeting in Poznan a year ago. And so it starts! This morning we welcomed more than 1000 pilgrims who came earlier to give a helping hand during the meeting. We gave them the Letter from Chile which begins with « joy » – and that is also how the meeting began. Many people, who helped with the meetings in Taizé during the summer or who come to the European Meetings every year, met today again. The number of smiles, laughter and embraces were uncountable and we didn’t know whether to say first: “Merry Christmas” or “Welcome to Rotterdam”. The tiredness of the long travel was forgotten by the sight of so many familiar faces. And even to those coming to such a meeting for the first time, this joy was contagious and they joined in that beautiful moment. 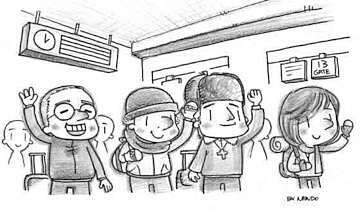 Nando (Korea) drew this cartoon, representing the participants looking for their way. We are seventeen volunteers living in a really small flat in a district near Ahoy where most of the inhabitants are immigrants without many resources. We are welcomed by a group of young people who decided to live in this zone in order to do social work and help kids and teenagers. Our host house is almost full but we are still expecting more young people during the meeting! At night, after a busy day, we meet in the small kitchen – which is almost five square meters – and we pray together in front of the icon of friendship. The two halls for prayers and the “silent room” are decorated around two themes characteristic of the country hosting this year’s European meeting, the Netherlands. The activity of the port city of Rotterdam is suggested by the presence of four boats, two in each prayer hall. They are typical old sailboats: Oceaan, ’t Leven IS Strijd, and Anne-Trijntje Rietaak. 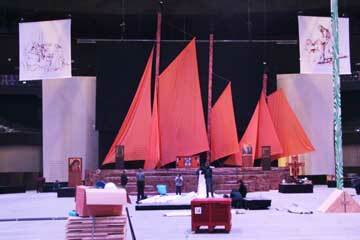 Large sails and masts up to 16.5 meters in height rest on a wooden structure depicting the hull of vessels. At the rear, the North Sea is represented by a projection. These boats are reminiscent of the large orange wings in the choir of the Church of Reconciliation in Taizé. All this, with candles, creates in the vast halls of Ahoy an atmosphere of prayer. This year, I decided to come two days earlier in order to help with the welcome and the preparation. Since I arrived, I was touched by two things: the welcome, and the sense of fellowship and community we are living all together these days. When I arrived at Ahoy, the place where we have the meeting and the prayers every day, I was immediately and warmly welcomed by the volunteers who came directly from Taizé, because I spent nine months there as a volunteer. I feel that we are all part of the same Christian family – through our common belonging to the Body of Christ. This first evening, I was welcomed in the local church and in a Dutch family where I will live during the meeting. There as well the welcome was friendly and very warm. Through this, I am discovering more and more that we are all drawing our communion from the same source, the love of God revealed to us by Jesus’ birth. The first time I saw the beautiful city of Rotterdam, I felt so cold, but my heart would be soon so warm. The family that welcomed me with open arms put all their trust in me, and offered me more than anyone could expect. Even if there are so many cultural differences, because I am a foreigner and a total stranger and besides, I don’t know anything about this familly, they still offer as much as I need. They crossed the boundaries and made us come together and share what we have. Though this meeting I really can see sometimes God work in each our heart. This is really beautiful. 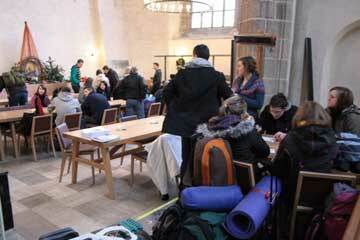 This morning in the host churches, reception after the final preparations, the first young people arrived. Throughout the day, everyone was welcomed and received a host family. Some had to wait later in the evening for the last ones to arrive. The 150 participating churches are quite diverse. The various Protestant churches, collectively known as PKN, Catholics and the Old Catholics were all prepared to receive the young pilgrims, who will spend the next few days taking part in three daily prayers, times of small-group sharing and various workshops. Being welcomed in your own languages makes you feel at home. That’s what we did today at the German welcome. It was great to see that at 6am forty volunteers were there to welcome all the German visitors. When they had their introduction in German, we sent them to the host churches and than they met their guest families. From the warmth of your own language, you’ll be ready for a dialogue in foreign languages. A group of youngsters passed the school we were in and said to each other “What’s going on here?” Rotterdam will know that the pilgrimage of trust has begun. So many people spread hope and God’s love. “The most important thing is for everyone to be greeted with a smile,” the brother told us during the explanations. So this morning there were around thirty of us armed with our smiles, welcoming the 1400 French who came to participate in this pilgrimage of trust. Wearing backpacks, they arrived throughout the day. After presenting the meeting, we sent them to different host churches so that each pilgrim could join a family offering them hospitality until January 1st. Conclusion of the day: everyone arrived and you can keep on smiling! Yesterday I was working in Hall 1 in Ahoy. It will be become a worship space for the meeting. So we needed to prepare many things before yesterday evening prayer. But there was a circus before that, camels and elephants were there. We were a bit wondering about our situation. But our team were really motivated. Finally evening prayer was so beautiful. I am very happy to work with such a nice team for the meeting! 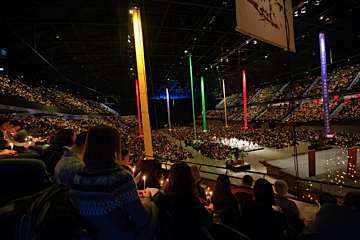 At the heart of the meeting in Rotterdam are the common prayers that take place every day at Ahoy. They are open to all inhabitants of Rotterdam and held at 1pm and 7pm, Friday 31 at 4:30pm. These prayers involve songs, short readings in different languages and a moment of silence in prayer, in two "worship halls " separate but connected by sound. They are followed, at noon, by a brief reflection on the Bible reading by one of the brothers. This kind of prayer is not only possible in a quiet village of Taizé, Burgundy but also in a modern city like Rotterdam. Tonight we received a text message from one of our host families: “I found out my neighbours also welcome Taizé guests. I didn’t know my neighbours, but now I do. It’s surprising, I welcome people from far away and meet my neighbours.” This message was today in a nutshell. In our small church in the center of The Hague we welcomed 130 young people today. This morning, the first group of young people from Slovakia came walking into our church with big backpacks, very tired, but still smiling. It was great to say ’welcome’ to them after two months of preparing their arrival. After the Slovakians came the Polish, the Russians, the Italians and the French. A lot of them came at the same time The best moments were of all kind of people meeting each other, shaking hands and talking in many different languages. A lot of us didn’t speak the same language, but we understood each other. A little boy put a smile on everybody’s face because he walked around all day in church offering everybody sandwiches and sweets, communicating with his hands and eyes because he didn’t understand the languages that were spoken. 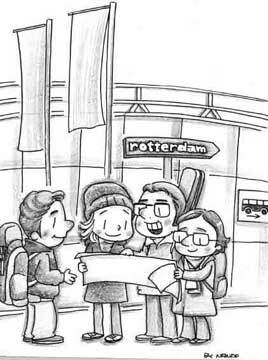 The young pilgrims were welcomed in Rotterdam in host families for the vast majority, and also in some collective accommodations. Right up until the eve of the meeting, the teams in the host churches had received messages from people willing to open their door— sometimes a young family with children, sometimes a elderly person living alone. All opened their doors to offer a place to sleep, breakfast and a festive dinner on the evening of December 31. This hospitality allows sharing and exchange. Everything is born of trust between the person who opens the door of his home and those who arrive without knowing each other, without even belonging to the same culture. The simplicity of this meeting is right in line with Christmas, since it reminds us that it is enough to share the little we have to welcome others, like the stable for the Holy Family. I arrived here in advance for help, after so many weeks of preparation and excitement at the approach of the meeting. It’s great to see the results. Seeing people so happy and ready to lend a hand, I realized it was really worth it! We are both 20 years old; it is our first meeting. We started around 8:30 in the our host church. All the guests came together and sang songs in different languages. After the morning prayer the guests could go to do their work, or talk in groups about their personal faith. Every day they get some questions to talk about. In our group there are people from Poland, Switzerland and the Netherlands. We read Philippians 4:4-7 in our own languages and the first question was: ’What makes you happy or sad?’. There was a girl in our group who wanted to share her personal story about her grandfather who died. She had feelings of sadness because she lost him, but at the same time she knew that he was with God. After some other personal stories we all left the church and went to the Ahoy. It was very impressive to see all of the people from different countries coming together to pray. I smiled when I saw those thousands of people gathered for prayer in the evening at Ahoy. Then I thought how nice it was that everyone has found a place to sleep and something to sustain themselves. It is a beautiful experience of hospitality and trust that is shown to us youth. I realized that in trying to cooperate we can build unity. We are never alone, through Christ who unites us – and this allows me to open myself more and more to believe and to love. May this feeling grow in our hearts! In the morning around 8:30 in the 150 participating churches a prayer takes place with songs from Taizé. The many different backgrounds of the young people hosted in Rotterdam these days is expressed through readings and prayers in several languages. Everyone then takes part in a time of small-group sharing, allowing them to get to know each other. Reflection is on the Letter of Chile that Brother Alois prepared for the meeting and the Bible reading from the prayer, around the themes of joy, compassion and forgiveness. This year I have the chance to participate for the third time in a European meeting of Taizé, in Rotterdam, with many young people from around the world. During this meeting, I am returning to the roots, through prayer, song, silence and reflection, I see that God is here with us, that he listens to our prayers and helps us move forward. Each year, I am deeply touched by the hospitality and kindness of our families and our host churches that have opened their doors wide for us. This sign of trust fills me with gratitude and desire to share widely with others what I have received. On December 29 and 30 during the afternoon, workshops on various subjects are held in different parts of the city of Rotterdam. These times of meeting open to all are led by representatives of the local church or of the country and brothers and friends of the Taizé Community. Key themes highlighted in these workshops are the search for the wellsprings of faith, the personal commitment of each person, the dialogue between art and Christian faith (in painting, music, architecture) and social relations between people of different cultures or religions in Rotterdam, Europe and the Near East. This afternoon the subject matter of the workshop challenged me: “Do we always need to go faster?” Each participant was asked to look for bible passages referring to the movement in a positive sense and others arising from a negative experience, passages referring to speed and other to slowness. The presence of contradictory aspirations reassured me about the presence of our dilemmas even in the Scriptures. The meeting in Rotterdam is then a precious and difficult time to take in our lives to discern why we rush and who we should take time for. I was very interested in the workshop on the topic “God is at work in us. How to hear and respond to his call?” I learned a lot about how to discover God’s call. Listening is the best way; silence can help us hear God’s message. I was surprised to see so many young people with the desire to discover their vocation. Fulfillment in life is essential – it seems to me that this workshop could help me, like all young people seeking their way. After already nearly six large common prayers in the two halls which are separate but connected by sound, I can say that this is the aspect of the meeting which touched me the most. Despite the size of the halls and the large number of people, these prayers really helped me find peace and joy in Christ. For me it is very important to pray with so many young people from different backgrounds in these simple circumstances – in fact just an exhibition hall – and in a large city like Rotterdam. All who wish may enjoy a moment of prayer and reflection in the "Silence" room. Brothers and sisters are there to listen to those who want it and priests are available for the sacrament of reconciliation. The space is decorated with care and allows young pilgrims to extend the common prayer with a more personal time and to go deeper into silence at the heart of a modern metropolis like Rotterdam. At the beginning of the meeting, several doctors and nurses from around Rotterdam set up a medical post in Ahoy. Luckily, the severity of the complaints has so far remained limited to things like the flu. But what to do with a girl with flu, who is too ill to take the public transport and will certainly need a bed and attention? Which family can we ask to take care of a sick person unexpectedly? With a lot of phone calls, we find a woman who is willing to offer a warm bed, attention and care. And in this way, a simple flu turns into a practical exercise in trust. Arriving for the second year as a volunteer at the European meeting, I was welcomed with open arms by the sexton of our host church , with three others, one French, one Swiss and one Belgian. The atmosphere like every year is a wonderful mixture of smiles, prayer, friendship, silence and joy. I was particularly marked by a question asked by a bishop in our sharing group on the theme of forgiveness, and the idea of finding someone to confide in: Is God our friend? Can we confide in him? The answer is yes, and we all agreed that forgiveness is necessary and that it often requires a very close friendship with someone who helps us to accept it, including one with God through prayer and meditation. This also allowed us to draw a parallel with the joy we have when we forgive, or when we receive forgiveness... the joy of being light-hearted. Each day at 11:45am and 5:30pm, all the young pilgrims congregate at Ahoy, the exhibition center which is hosting the meeting. The communal meals are distributed and shared in the large halls. These simple meals are like a hot picnic. Each person was asked to bring a spoon and a bowl for tea. Everyone receives a portion of a hot dish, bread, cheese, fruit, a biscuit and water. The distribution is a real challenge. Because of the large distribution lines it takes only a few minutes to serve tens of thousands of pilgrims these meals. The many young people involved in the efficient running of this operation are thus also part of the practical organization of the meeting, serving others. A day ago in the prayer I saw a group of people singing in sign-language. That deeply moving and touching sight got me inspired. The desire for communion with others, joy of heart and God must be beyond our human senses. They are all over, all-surrounding, within each one of us. I still remember my first meeting, in Geneva. The first thing I noticed was the impressive number of young people who came to this meeting. I felt very small, not because of my age, but because I knew very few people and felt a bit lonely. Year after year, I came to the conclusion that by smiling at others I would not feel alone anymore! As usual, in our host churches we reflected on the Bible and prayed together. Both the families and the churches opened wide their doors and their hearts. After a celebration in the participating churches and a snack with parishioners and with host families, the young pilgrims had to return to the train station or the car park for the buses at the time of their return home. It took a little patience until all the buses could leave the big lot and set out on their way. At the station, many groups of pilgrims with their big bags were waiting for their train. For some, the journey will be long. It will be an opportunity for some rest but also to reflect on what had been experienced during the five days of meeting and consider how to continue back home, how to live in everyday life what has been shared. Joy, compassion and forgiveness. In the small sharing group in which I participated, we concluded that these three impulses given by the Letter from Chile are born in relationships between people. These relationships were precisely at the heart of the meeting, with our guests in the host churches, in the group sharing, with the small work team. By being open to others, I witnessed the birth of the joy between us all. It was also striking to hear all those who were surprised and pleased that the many churches of different Christian denominations in Rotterdam participated together in the meeting. Again, it is by the act of taking a step towards others that a new joy is born. Friday afternoon, after the prayer which was held exceptionally at 4:30pm, all the young people returned to the host churches. Before beginning the new year, a prayer for peace was celebrated. Then, extending the joy of the New Year and the spirit of peace among peoples, each nation was able to share a little entertainment – a dance or a song from their country. In these exchanges, all were able to realize what they could learn from each other, in this meeting of cultures from across Europe which left a good place for the folklore of Poland, Ukraine, Croatia and many other countries. The young Dutch people also had the opportunity to present their country, and the host families could share their culinary talents with a few special dishes. Though the meeting is already finished, that does not mean that everything stops. Some brothers and young volunteers who helped prepare the meeting will remain in Rotterdam for a few weeks. This is an opportunity to say thank you to everyone who made the meeting possible, beginning with the participating churches and host families. Prayers will be held so people can meet and share about their experience, about the events, expected or not, that marked the five days of the European meeting. Daily prayer will continue until mid-January. 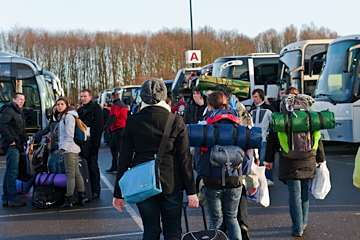 Back home, the young pilgrims from all over Europe will also be invited by the various group leaders to come together and share. And for some, a stay at Taizé will be a new stage in the pilgrimage of trust on earth. God loves us – just as we are. No matter what the color of your skin, your age or your religion. God’s love is like a gift that we possess. It teaches us not only to receive, but to share with others what we have. Here in Rotterdam, at the European meeting, I found peace for my soul and my heart. Praying together with so many young people from different countries, spending a few days with a host family, and sharing my experiences with others gave me more strength to pursue my goals in life with God who cares for me and loves me, and also to better cope with the problems I encounter in my life. After a few days the pilgrims are back home, and life goes on in Rotterdam, in the families and the host churches. As Brother Alois said the first night, until the very last minute the inhabitants of Rotterdam, Delft, Utrecht, The Hague and other cities opened their doors. In the last days, until the day before the meeting, hundreds of additional places were found. Another highlight of the meeting was the involvement of so many different Christian communities in the preparation. Reformed, Roman Catholic, Old Catholic, evangelical and Orthodox Christians hosted the young in one way or another. Often, this involved a true collaboration. For example, for the first time Catholics and Protestant television stations in the Netherlands presented daily programs on the second national channel. Another example of joint work was a program prepared for teenagers between 12 and 17, created by the youth ministers of the Churches, with a special welcome and workshops. Moreover, one can undoubtedly say that never have there been so many workshops offered to the participants. The civil authorities were very involved, such as the mayor of Rotterdam, Mr. Aboutaleb, who even led a workshop. Finally, the staff of the central meeting-place, the Ahoy exhibition center, was very open and attentive to make sure everything happened in the best way possible.